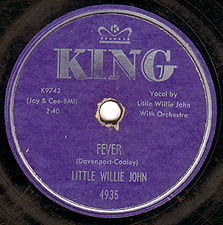 Little Willie John first recorded “Fever”, a song written by Eddie Cooley and Otis Blackwell (as John Davenport) in 1956 for King. It was a #1 smash on the R&B charts and it even crossed over to #24 on the elusive pop charts. The tune was so popular that it led to many immediate covers. In 1957, both Ray Peterson and Earl Grant took a crack at it. Then in 1958, Peggy Lee put her unique, seductive stamp on it and it rose to #8 on the pop charts and an incredible #5 on the R&B lists. In 1960, Elvis featured “Fever” on “Elvis Is Back,” his first LP after being discharged from the Army. Alvin Robinson bubbled under the Hot 100 in 1964 with a great retelling of the song and the McCoys followed up their “Sloopy” success with a top ten version of “Fever” in 1965. Now, listen to them all and decide which one you truly DIG THE MOST! Also on this week’s program, we feature some birthday tributes to Bobby Darin, Troy Shondell and Charlie Gracie. Which One Do You DIG The Most? - "Fever"
5/7/10 – The History of “See See Rider” Cat Fight! 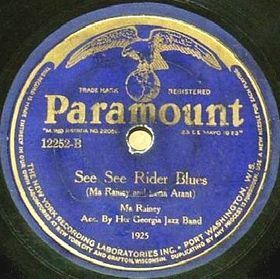 This week, I trace the history of another blues and rock n’ roll standard, “See See Rider.” It’s one of those songs that just feels like it’s been around forever, but like every great tune, there’s a story to tell. Ma Rainey first dropped this on shellac in 1924 with the help of Louis Armstrong’s band. It became a sensation in 1925 and that lead to many different covers of the tune. I’m presenting a brilliant version by Bea Booze (1943), a doo wop version by The Orioles (1952), the first rock n’ roll version by Chuck Willis (1957), LaVern Bakers retelling of the tale (1962) and the Animals’ “take no prisoners” take from 1966. Listen to all six versions in their entirety before making your decision and voting for your favorite. I will also have a collage that features versions by Leadbelly, Mississippi John Hurt and Elvis Presley. Also on this week’s show, we bet on the horse races, hear a killer record from The Calvanes AND pay special birthday tributes to Johnny Maestro and Ricky Nelson. Which One Do You DIG The Most? - "See See Rider"